So while fans of Guillermo del Toro (Pan’s Labyrinth) were eagerly anticipating the premiere of his newest film, Mama, last Friday, most of the world won’t notice it. Despite Mama debuting at number one with more than $28 million in the weekend’s box office, Del Toro’s upcoming summer blockbuster Pacific Rim, opening in July, will attract a much wider audience, as did Hellboy, which he wrote and directed, and Rise of the Guardians, the recent animated holiday release on which he was executive producer. Given del Toro’s prominence and power as a contemporary mythmaker, Mama and its representation of motherhood bear some exploration. In four films (so far)–The Devil’s Backbone, Pan’s Labyrinth, Don’t Be Afraid of the Dark, and now Mama–del Toro embodies the very real childhood fear of losing one’s parents in a variety of mythical creatures that terrorize children until they either die or are saved by new and/or redeemed parental figures. Del Toro is known for drawing on fairy tales, so perhaps it should come as no surprise that in all four movies, the children’s birth mothers are dead, dying or absent, and their replacements are not much better. The two most recent films in this series (Dark and Mama) feature a Hollywood archetype I like to call the Reluctant Mother. Think Diane Keaton in Baby Boom. Just as the Reluctant Hero is forced to go upon a journey when he would rather not but nevertheless manages to prove his heroic nature and learn valuable lessons, the Reluctant Mother does not not choose motherhood but rather has it thrust upon her. After bonding with actual children–and in del Toro’s films, trying to save them from monsters–the Reluctant Mother usually realizes she really did have it in her the whole time. Ah, motherhood: so instinctual all it takes is a demon from an alternate universe to make you want to do it. 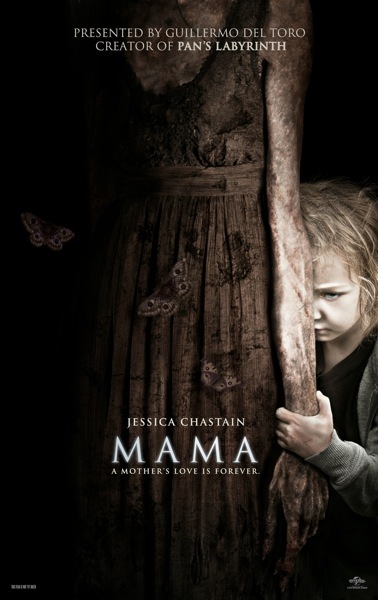 In Mama, two young girls are taken by their crazed father–who has just shot their birth mother–to an abandoned cabin in the woods. Just before he can kill his children and himself, he is killed by a poltergeist-like monster who then raises the girls in the wild until, one day, they are rescued by an uncle and his girlfriend, who take the girls to a new home. Mama, as the girls call their monster, tags along. The girlfriend–played by Jessica Chastain (Zero Dark Thirty) and identified as Reluctant by the excitement she shows at the beginning of the film upon reading a negative pee-stick pregnancy test–can’t quite hack laundry and meals, but she does prove handy in fighting Mama, who it turns out does not always have the girls’ best interests at heart. This motherhood triptych–one dead, one Reluctant and one supernaturally evil–tells us a lot about the contemporary anxieties regarding parenting that inform del Toro’s and other contemporary films of the supernatural. Family structures are changing along with women’s social roles: Not all children are raised by their birth mothers, not all women want to be mothers and, as exemplified by Mama (who it turns out was a Victorian mental patient who killed herself and her baby and then hung around as a ghost looking for children to raise in its place), not all women should be. Mama‘s typical January-film problems–plot threads that are introduced only to be abandoned and supposedly-smart characters who insist on investigating something they know to be dangerous at night and alone–keep the film from saying anything very specific about these fears. If the movie does represent a progression in del Toro’s exploration of motherhood, it is an unfortunate step in the wrong direction. At least when Katie Holmes’ Reluctant Mother in Don’t Be Afraid of the Dark is killed, one can argue that it shows she shouldn’t have been forced into that position to begin with. Chastain’s decent performance aside, I prefer the independent, Pat Benatar-esque rocker she embodies at the beginning of Mama to the one who ends the film having learned her lesson: Her place is in the home. Despite the common backlash against women who dare to to criticize representations of women in these fields (shout out to Anita Sarkeesian), we should keep an eye on del Toro–even his January releases. He is a master monster movie maker. As he no doubt continues to use a variety of media to represent the ways we are scared by changes to traditional family structures, I hope he’ll turn from punishing the women who benefit from those changes to questioning why the idea that some women don’t want to be mothers scares people so very, very much.